ASPEN – Aspen schools were closed. Flights were canceled. Roads were treacherous. 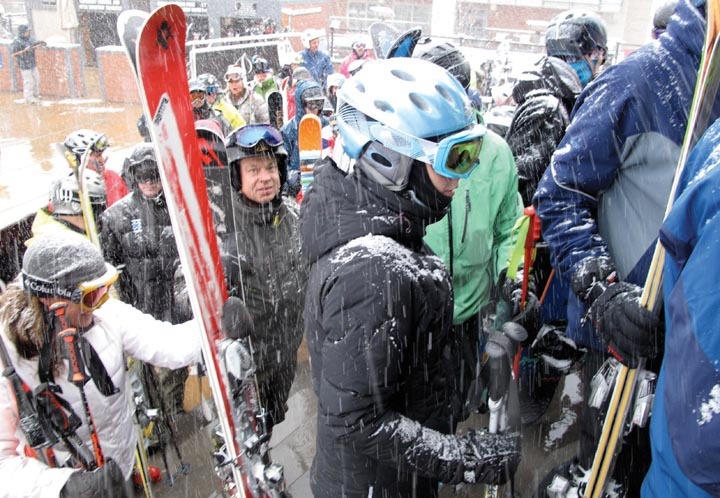 But skiers were happy Tuesday, as a powerful winter storm dumped up to a foot of fresh snow on local mountains. In fact, the Skico reported 12-16 inches of fluff out of the latest storm cycle, putting base depths on the ski hills at 1 to 2 feet above this date last year. Also celebrating the winter storm were Aspen school kids, who had their first snow day in two years. While some questioned the early morning decision to cancel classes Tuesday, Aspen Superintendent John Maloy explained that the amount of snow is not always the determining factor for calling a snow day. Maloy said the school district begins the process of determining whether to cancel school at 5:15 a.m. by driving the bus routes. He reported that only one parent called to complain about the cancellation while several others e-mailed their thanks for erring on the side of caution. Of course with big snow comes big headaches for travelers. According to Francey Jesson, assistant aviation director for Sardy Field, the Aspen airport was at a virtual standstill on Tuesday, with flights canceled, delayed or diverted due to weather. “It’s been hit or miss, but mostly miss,” she said. “A few flights tried to get in, but were diverted, so the airlines were using their bussing plans to get people in and out. Valley commuters also braved winter conditions with slippery streets and blowing snowdrifts making driving difficult. However, the Colorado State Patrol was reporting only one major accident as of the evening commute. The four-car pileup on Highway 82 stalled traffic, but no fatalities were reported.